French children happily eat everything–and most of what they eat is healthy. That’s not all: child obesity rates in France are significantly lower than in North America, where poor nutrition is so widespread that it threatens the health and well-being of our children. So how do French parents teach their children how to eat so well? And how do the French government and school systems support families, teachers, and farmers to provide food education? FRENCH KIDS EAT EVERYTHING answers these questions, and more. Moving her young family to her husband’s hometown in Northern France, Karen Le Billon is prepared for some cultural adjustment, but is surprised by the French food education she and her family (at first unwillingly) receive. In contrast to her daughters’ picky eating habits, French children feed themselves neatly and happily—eating everything from beets to broccoli, salad to spinach, mussels to muesli. The family’s food habits soon come under scrutiny, as Karen is lectured for slipping her fussing toddler a snack–“a recipe for obesity!”—and forbidden from packing her older daughter a lunch in lieu of the elaborate meal on the school menu. 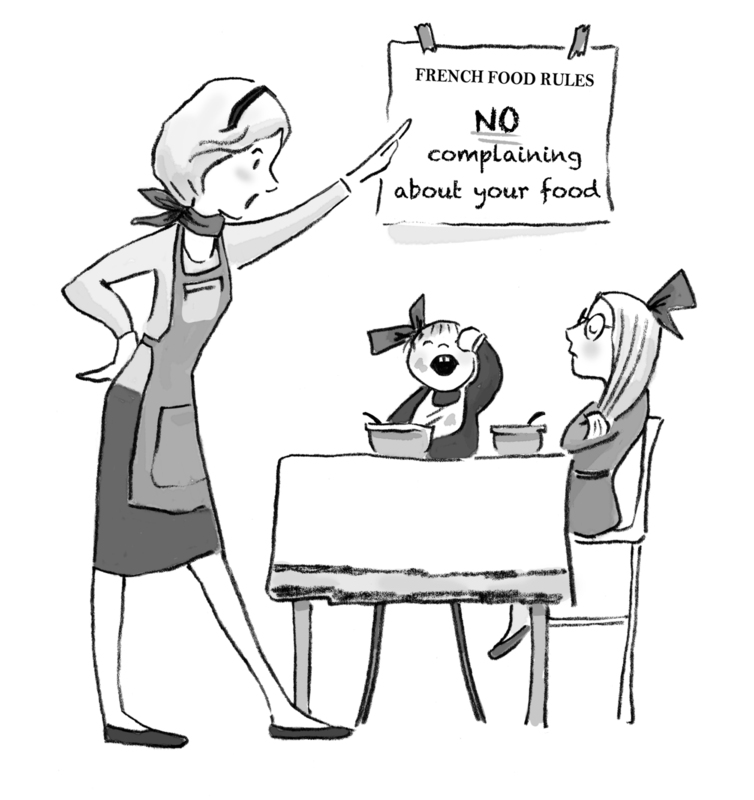 The family soon begins to see the wisdom in the “food rules” that help the French foster healthy eating habits and good manners—from the rigid “no snacking” rule to commonsense food routines that we used to share but have somehow forgotten. Soon, the family cures picky eating and learns to love trying new foods. But the real challenge comes when they move back to North America—where their family commitment to “eating French” is put to the test. The result is a family food revolution, with surprising but happy results–which suggest we need to dramatically rethink both the way we parent, and the way we feed children, at home and at school. Combining personal anecdotes with recipes and practical tips, FRENCH KIDS EAT EVERYTHING provides a humorous, provocative look at the way we feed our kids. The result is a personal transformation in eating and parenting. Pingback: What’s for lunch in France? | What's for lunch?